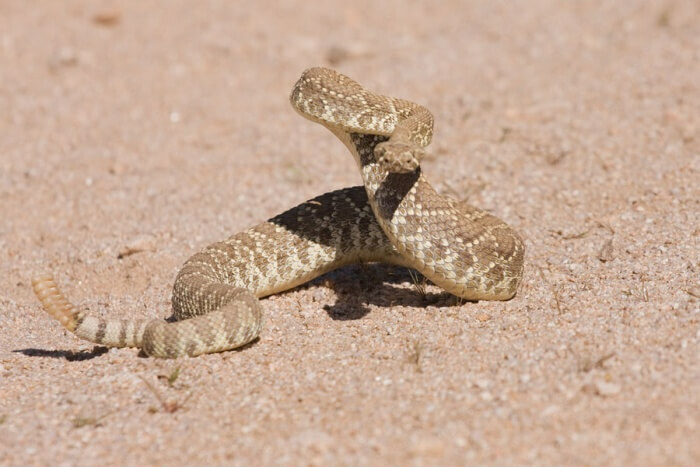 Rattlesnakes eat a variety of foods, including rabbits, ground squirrels, rats and mice. The snake generally hunts for food at dusk and uses a forked tongue to pick up odors from prey and then ambushing the prey as it happens by. The rattlesnake has extraordinarily developed senses, including heat-sensitive pits on the sides of its head that can detect heat from potential prey. This allows the rattlesnake to see the heat from the prey in the dark, so it can strike out at prey in the darkness. The venom that the rattlesnake injects in its prey allows it to pick up scent particles with its tongue to locate the prey, even in darkness.